Drawing from over 100 hours of never-before-seen footage that has been tucked away in the National Geographic archives for over 50 years, Jane tells the story of Jane Goodall, a woman whose chimpanzee research challenged the male-dominated scientific consensus of her time and revolutionized our understanding of the natural world. Jane is a visually stunning, fascinating and often deeply moving documentary. Using footage recovered from National Geographic archives and a to-camera interview with Jane Goodall herself, this is the story of a truly remarkable woman. Brett Morgen's documentary starts by asking two key questions - how did a young woman with no scientific degree end up studying chimpanzees in the tropical forests of Gombe, Tanzania? What did famous paleontologist, Louis Leakey, see in Goodall that made him choose her for this project (a study of primates to help further the understanding of early hominid societies)? The answers soon become clear. The film's archive footage reveals a quietly determined, observant and endlessly patient woman. A woman who is both sensitive and strong, inquisitive and analytical. In addition, and perhaps most importantly, Leakey recognised Goodall as a person who possessed a boundless love (and respect) for all animals. Of course, as the documentary shows, Goodall’s chimpanzee study was far from perfect. She made mistakes and has been criticised by some experts - many of whom have questioned her methods. However, it is hard to imagine any other way of establishing such close contact with Gombe’s chimpanzees. In addition, who could argue with the importance of her groundbreaking observations? Morgen juxtaposes these incredible scientific discoveries with how Goodall was portrayed in the media. The proliferation of news stories that focus on her gender, marital status and looks (including the length of her legs) would be ridiculous if they weren’t so sickening. The footage of Goodall’s interactions with Gombe’s chimpanzees is breathtaking. Their world is fascinating, poignant and, at times, disturbingly violent. On more than one occasion during the documentary, we fear for the safety of Goodall and her colleagues. One of these colleagues is National Geographic photographer, Hugo van Lawick. Initially, Goodall was irritated by van Lawick’s intrusion into her world. However, the couple soon fell in love, got married and had a son - affectionately named Grub. Jane examines the challenges that Goodall experienced trying to balance her work in Gombe with her family life. Before long, the strain starts to show - particularly with regards to Grub’s education, safety and wellbeing. 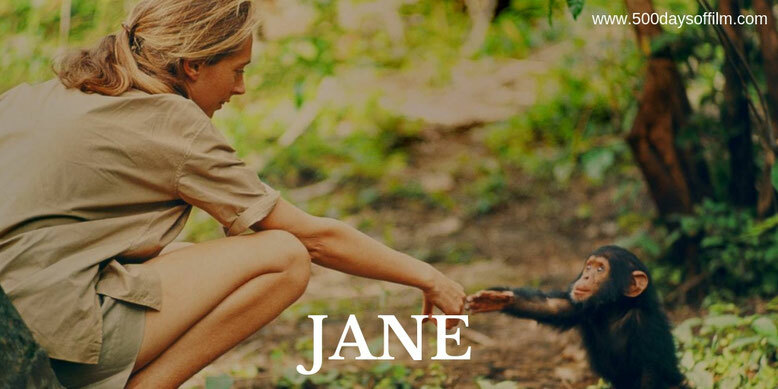 Jane is a visually stunning, immersive and moving documentary that works on many levels. Morgen's film explores the challenge Goodall faced in trying to be a scientist and a wife, a conservationalist and a mother. However, above all, this is the story of a remarkable woman who pioneered a tremendous scientific study - one that continues to this day. Jane features a wonderful orchestral score from legendary composer, Philip Glass. Have you seen Jane? If you have, what did you think of this documentary? Let me know in the comments section below or via Twitter. You can find me @500DaysOfFilm.